After a brief hiatus from blogging, I have returned with a healthy vengeance! For those who don't already know, I am 18 weeks pregnant. 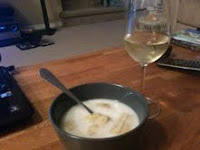 What this means for the blog is that I have to give up wine (sob!) and start watching what I eat more closely. No more sushi, no more lunch meats, no more soft/unpasteurized cheeses...but that doesn't mean that I can't have fun with food anymore! One of these fun, healthy foods I have been enjoying of late is quinoa. If you are unfamiliar with quinoa (pronounced KEEN-wa), it's a grain that is said to originate in the Andean region of South America. What makes this food so super is that it's known as a complete protein, containing all 9 essential amino acids, making this a great food for the vegetarian/vegan diet. It is also gluten-free, great for celiacs too! All this on top of being fun to say, of course :P Quinoa can be cooked up like rice, couscous, etc, or eaten raw, but I find it best to rinse it first to remove it's bitter coating. My vegetarian mother introduced me to quinoa a couple of years ago while I was visiting her back in my hometown. She likes to cook hers up and grill it in a wrap on a panini press with various vegetables she has in the house-she also includes hummus and sometimes cheese. One time she threw avocado in a wrap she made for me, WOW! I was sold on quinoa in that moment! We've had quinoa in the house for the past week and since I'm a "qui-newbie" with using it, I referred to some of my cookbooks, as well as the internet, to see what I could do with it. I made 3 side dishes for 3 meals throughout the week to use it all up. A great time-saving tip I found on cookingquinoa.net is to cook up a large amount of quinoa at a time, way more than you need, and use it as you need it throughout the week. The first dish I attempted was called Basil Quinoa with Red Bell Pepper. Cooked quinoa is tossed with red bell pepper in a pureed basil-parmesan-garlic-lemon homemade dressing. I served it as a side along roasted pork tenderloin in a curry paste rub. The recipe is found in the Sonoma Diet Cookbook. Although the recipe is definitely healthy, I found it to be lacking in taste, despite the fact that I used fresh basil, garlic, etc. I will make it again, but will double the dressing recipe for added flavor. 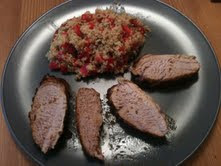 The next dish I tried was also from the Sonoma Diet Cookbook, Grilled Beef with Quinoa and Vegetables. In this dish, cooked quinoa is combined with green beans, roasted bell peppers, and a dressing that includes red wine vinegar, olives, and olive oil. I had to make a few changes because I didn't have olives, and I prefer to eat my bell peppers raw instead of roasted. I served it alongside a top sirloin steak with a fennel seed rub. I will definitely make this again! Finally, I found a great salad recipe on cookingquinoa.net that pairs fresh cherries and quinoa with other power foods such as spinach and walnuts. Click here to see the recipe! Of course, I made a few changes. Instead of goat's cheese I used cranberry/pepper flavoured Boursin cheese, I didn't toast my walnuts, and I thawed frozen cherries and used the leftover juice to make a cherry vinaigrette. In my opinion, this was the best of all 3 recipes I tried. The bitterness of the spinach and walnuts was muted but was still complemented by the sweetness of the cherries and the cheese. Wonderfully balanced dish. It got great reviews at the BBQ I originally served it at, and I liked it so much I made it again tonight (cheese-free) as an accompaniment to chicken breasts stuffed with the leftover Boursin. Quinoa doesn't have to be limited to just sides and salads - there are tons of other great recipes for cooking with quinoa, including the ones on the website I mentioned above. There's a recipe on the site for flourless chocolate cake, and I definitely plan to try it sometime! All you have to do is look, cook and definitely open your mind. At first, I had no intention of trying quinoa. And thanks to my mom, I'm glad I did! As a hockey fan who bled white and blue blood for years, I'll never cheer for Boston, one of the Toronto Maple Leaf's eastern conference rivals. Here's another reason why: Bruins defenceman Tomas Kaberle. He was traded from the Leafs organization earlier this past season, and after doing nothing productive in Toronto for many years, he walks onto a team that wins the coveted Stanley Cup, doing little else in Bean-town besides adding a couple of assists to the team late-season and in the playoffs. It must be nice to walk onto a team and be taken along for the ride for the ultimate prize! 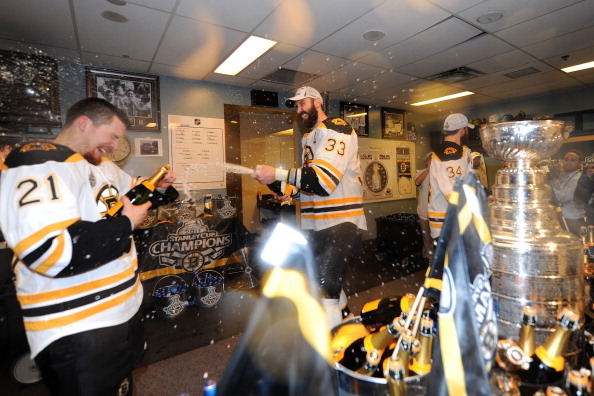 Despite the fact that I dislike the Bruins, I do admire their taste in celebratory Champagne. I wonder if they chose it because their famous label matches the team colours, because they wanted something high-class, or any other number of reasons? Either way, they chose well! Congratulations to the Bruins and their fans, the harder working team did win last night! Well deserved. Side note: In a pre-game interview with CBC, Bruins forward Mark Recchi mentioned that he's been saving a special bottle of wine to celebrate a cup victory-and he would probably drink it anyways even if they didn't win. After a brief google session, I think the bottle he was talking about is his 1970 Petrus, one of Bordeaux's finest. It also turns out he has quite the extensive cellar, totalling over 1,000 bottles! Even though there are rumours flying around about his retirement, he just became one of my favourite players-how can a wino dislike a wine afficionado, after all? The month of May is almost over. Can you believe it? They say time flies when you're having fun. I can agree to that, especially now that I'm having fun in the kitchen! Awhile back you may have read my post about trying to cook some Asian dishes. As of today, all the recipes have been tried and tested, and here's how it all turned out. I think it would pair well with a Riesling or Gewurztraminer. The first major 3 course meal I did using the slow cooker was on May 20 where I tried my hands at a Chinese themed menu, which ended up being 2 courses because it was a Friday and we were pressed for time for later plans with friends. I did a honey hoisin chicken in the slow cooker, using onions instead of sesame seeds, what I was originally going to do. My hubby makes a delicious veggie fried rice that he paired up with it. And I forgot to accompany all this with garlic stir-fried broccoli. Whoops! The rice is always good, so props to my man as usual! The chicken breast recipe I've tried before and is a keeper, especially with the onion substitution-it added great depth of flavor. The wine pairing was an unoaked Mondavi Chardonnay from Cali that I thought would show more sweet, fruity flavours, but instead had notes of butter and vanilla; tasting like it was slightly oaked! For dessert I whipped up some almond cookies. Originally I was going to try to do them a little more fancy, but they wound up being regular cookies. We had friends over later that night and they said they enjoyed the cookies (almost all were devoured! ), so I'll consider that a pass where the wine pairing was an epic fail. 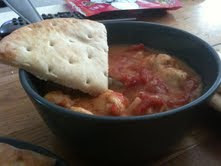 The verdict: Tasty, and an easy dinner to whip up. The verdict: Outside of the dessert, I shouldn't quit my day job :P But the pairing proves that I'm learning something in Sommelier school! Next up for the finale of the Biggest Loser, I cooked up Beef Madras, the recipe on the side of our bottle of red curry paste. I paired it with an Argentinian Malbec (more on that in a future post). My husband requested that I use twice as much curry paste as the recipe calls for, so I did, and boy were our mouths on fire for the duration of the show! It is the first time I've ever used naan bread for anything other than dipping-I had to use it solo to cool off my mouth between bites! And the wine didn't help because the Malbec was spicy and just re-ignited the 5 alarm blaze! 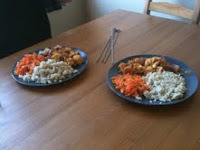 The verdict: I'll do this one again, but next time only use the amount of curry paste it calls for! I love spice, but I have my limits! The verdict: now that my nose has stopped running from all the spices, I must say that the best of the Asian dishes came out tonight, both the Tikka kebabs and the sambal (although I think the carrot dish is really a Thai side)! Next time I might style up the food for photos for aesthetic purposes. Now that May is almost over and I have vacation coming up in June, I plan to take the month off. Maybe if I stay out of the kitchen for a little bit time will slow down and us Canadians can enjoy what little summertime we have!